My alarm went off with a start at 5.45, and it was only a matter of seconds before I remembered why I was up so early. I turned to find my bed empty as my other half had decided to sleep on the couch as not to wake or disturb me during the night. I’d only had about 4 hours of undisturbed sleep anyway, but I did appreciate the gesture. 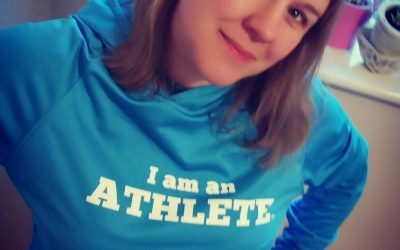 All my kit was set out carefully the night before, so it was just a matter of getting dressed and having breakfast – wholemeal toast and jam, and then I made my way to the East London Runners meeting point for the coach to the start line. It all felt very surreal, making my way with my big red bag. 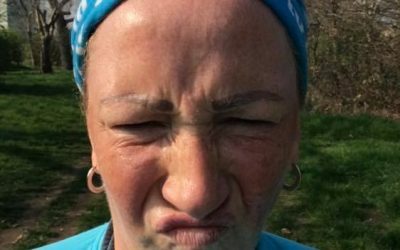 I sat at the bus stop in the morning sun awaiting my fellow club runners and there was an eerie silence, what had I let myself in for? But once the others arrived and we boarded the bus I felt a bit more jovial, as well all shared our stories of preparation for the big day. So after a group photo and a stroll through the Greenwich foot tunnel, and up a massive hill in Greenwich Park (so much for conserving my energy) we joined the masses before splitting to go to our right zones and pen numbers. The weather was great, all my worrying last night about finding my gloves and having something warm to wear at the start line were completely unnecessary. As I handed my kit bag to the truck with my corresponding race number, the jolly “truck driver” looking chap said “Well Done Julie” which had me a bit baffled for a while until I remembered that I had put my name on my vest. A few minutes later a lady tapped me on the shoulder and said “I love that…its exactly how I feel” she had spotted the @fattymustrun on the back of my vest – I’m glad I found my fabric pens last night after realising i’d left it too late to get it done properly. A quick trip to the loo and we were set, but as we stood in Pen 9 (the one earmarked for Rhinos, Stilt walkers and anyone else predicting a slow time) I realized I needed to go again… but thought perhaps it was the nerves. It took about 15 minutes to cross the start line and then we were off. It didn’t take long for me to get overwhelmed, running along Blackheath I thought to myself “I’m actually doing it, I’m running the London Marathon”, what was quite frustrating though was how many people were already power-walking…so I did spend quite a bit of time dodging people. I realized at about mile 2 that I did need to go to the toilet afterall, and thought perhaps I should just get it out of the way so I would have a more comfortable run. I probably lost about 10 minutes queueing up…but it was well worth it. At mile 4 I got a bit emotional, I saw a lady with some kind of disability making her way slowly but surely with the help of a walking frame and I thought I had a challenge ahead of me. I also spotted a fellow Great Ormond Street runner with a message on the back of her vest saying “In Memory of Rosie” and that was it I did shed a few tears as I thought about how poorly my nephew Rio was when he was little, and how lucky I am to be running in support of his time at GOSH rather than in his memory. 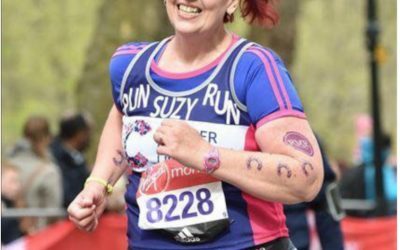 It wasn’t long before I hit Greenwich, I had made a list the night before of people I knew who would be out on the course and where they would be so I was expecting to see my work colleague Fiona, but I soon realized what a challenge this would be. The noise levels in Greenwich were phenomenal, it hit you like a wall. There were literally hundreds of people shouting your name…I gave up trying to spot her in the crowd and then started worrying if I would see anyone at all. In Surrey Quays though I saw my friend Kathryn who was almost as ecstatic to see me as I was her, so I stopped and gave her a massive hug. I knew at mile 9 GOSH had a cheering station so it was possible I might see friends and family there too, so with a spring in my step I carried on, still feeling quite fresh and then I saw my fiance which made my day – I stopped for a kiss and to hear how wonderful I am and I gasped with a smile “I think I’ve gone off too quick” as I think I was about an hour and 40 minutes in at this point, but he said no keep going, so I did – my thinking was that regardless of how fast I go it’s still gonna hurt in the later miles so I’d rather just get the first half out-of-the-way, besides I’m quite confident in 10K and half marathon distances so I just kept going. Going across London Bridge was great, it wasn’t as busy as what I’ve seen on TV but the support was brilliant. I saw Denise Lewis interviewing someone on the roadside as I scanned the roads looking for my Mum, who had said she might be at Tower Bridge…problem being that everyone looked like my mum and everyone was shouting my name. At mile 13 I knew my friends Alison and Sharon would be waiting for, as Alison has a luxury pad on the 2nd floor of an apartment block alongside the route, and there they were watching it all go by with a glass of wine and bacon sarnies I’m sure, so with a massive overhead wave, huge smiles and a couple of blown kisses I carried on. I felt strong, I just worried about what I would feel like on the way back come mile 22. I carried on running to mile 17 where another GOSH team gave me rapturous applause, and this is where my iPhone gave up and maybe where the cracks began to show with me. By this point I’d had 3 gels and 2 bottles of lucazade as well as water at most stations and was starting to feel a bit nauseous, so I started to walk for a bit. Mind you by this point I could feel blisters forming on both feet, I had chaffing (no I’m not telling you where) and my hips were hurting, so probably walking wasn’t a bad idea. I popped a couple of paracetamol to take the edge off the pain, refocused and after a bit of a stretch in the underpass before Canary Wharf I found my running feet again. Somehow I found my form again, it might be partly cos I was expecting to see my Mum and Sister at Canary Wharf – well if truth be told I wasn’t sure where they would be, or if the weather reports had put them off all together – but my sister works in Canary Wharf so it would probably be her first choice of viewing spots. 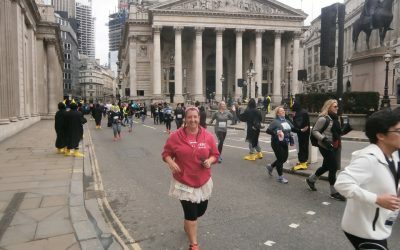 The crowds were phenomenal, and as I ran past the Barclay’s building where I can often be found on the 22nd or 23rd floor in a London 2012 related planning meeting, I realised just how far I had come, as it was in 2005 when I had drunkenly announced that I would run in the London 2012 Marathon…despite being almost 5 stone overweight. The noise was deafening, and I ran straight past my Mum, my two brothers, 2 sisters, 2 nephews and 3 nieces who had been waiting patiently with haribos and a “Come on Julie” poster, it was only my younger brother Dean chasing me down the road with a beer in his hand that got my attention, he was so proud, as was my older brother Gary who caught me up to film me in full flow. I was gutted that I didn’t see my mum, but was over the moon to know she was there supporting me. Mile 20 was always going to be a big moment, as my running club the amazing East London Runners were manning the water station, they would surely be looking out for me, and I didn’t want to disappoint, so I kept on keeping on, head up working hard, and then I spotted chairman Frank in his red ELR hoodie with Don, my faithful companion (ie backrunner) who between them have had to put up with my huffing and puffing, and at times incredibly slow weekly club runs. The guys at the water station were great too once they recognized me, and I was so glad that I was still running. I was a bit disappointed that I hadn’t seen my fiance at mile 20, as I had said it would be a good viewing spot. But I later found out he was there but unfortunately I had got there first, as I was running ahead of my predicted times. He waited for me there for over an hour and a half until he got to the point where he was like “there is no way she could be this slow, unless something has gone wrong” so he made his way to the finish line. Meanwhile I was still plodding on. At Mile 21 I had the amazing privilege of being cheered on by the Run Dem Crew, a running club from West London. They were making the most amount of noise for everyone going through…they had so much energy and must have been keeping up that effort for at least as long as I had been running. 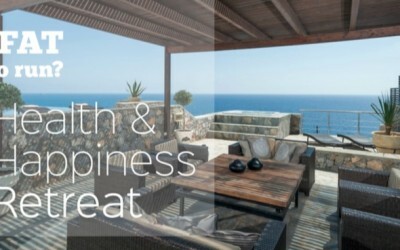 So a huge Thank You to them! A little while later, in amongst the chanting of Julie, Julie, Julie (whoops now you know my real name) I heard my full name being screamed by someone, it was a friend of mine who I used to work with, again she was over the moon to see me…so with an enthusiastic wave I carried on back towards Tower Hill for the 2nd time. Sharon and Alison had their eye out for me at mile 22 and I was determined to be in reasonable shape, so I kept running, giving them a wave as I went and now for the first time it felt like I was actually gonna finish. All my worries about hitting the wall, what wall?? The run from mile 24 to mile 26 was a bit of a blur, all I know is that it has started to rain and it hurt like hell, but I didn’t stop running. There were scenes of devastation as people started dropping like flies, St Johns Ambulance really had a tough job at this point, but the crowds were phenomenal…where up until now crowds were generally cheering you on, the crowds here were really picking you out and encouraging you when you absolutely needed it “Julie, what you are doing is amazing”, “You are an inspiration”, “Come on me Julie, go on girl your almost there, don’t stop”, I was seriously holding back the tears, my bottom lip was quivering and not just because of the chill the rain had brought with it. A final GOSH cheering squad at Mile 25 and I knew it was almost over and I looked forwards to finishing off what had been an amazing day, and just as I thought it was all over I saw my little sister Amy, and my Nephew Thomas 6 and my Niece Ruby 5 just by the 800 meters to go mark, so after kisses all round I prepared for my moment of glory I don’t know where I found it but my legs had a little more left in them and I managed the last few hundred meters at a reasonably fast pace, despite the shooting pains in my hips, the numbness in my fingers and the blisters on my feet. That was great! I’m obviously a year late in commenting but that’s not my fault. I’m impressed with your memory aside from the effort of the marathon. My race reports are like, “the gun went off, I ran, I walked, I ran again, I finished”. I had a whole 26 miles to think about what I would write!! I know we only crossed paths briefly, but I am so in awe of your journey, Julie. You are, truly, an inspiriation. And *bloody well done* too! 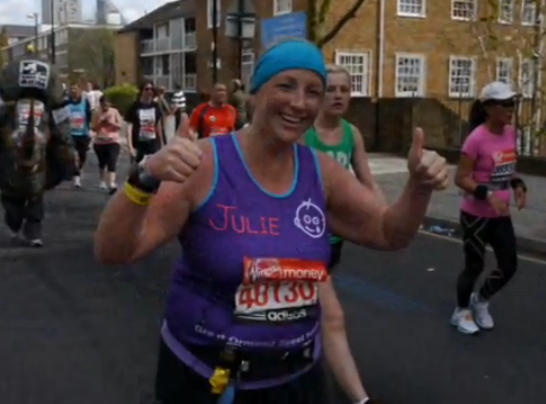 Well done, Julie, on your first ever marathon!! 🙂 Amazing! !